Two years ago, as a graduate student in Physics at USC, I began work on a game whose mechanics were based on quantum mechanics. When I had a playable version ready, my graduate adviser, Todd Brun, put me in contact with IQIM’s Spiros Michalakis, who had already worked with Google to design qCraft, a mod introducing quantum mechanics into Minecraft. Spiros must have seen potential in my clunky prototype and our initial meeting turned into weekly brainstorming lunches at Caltech’s Chandler cafeteria. More than a year later, the game had evolved into Quantum Chess and we began talking about including a video showing some gameplay at an upcoming Caltech event celebrating Feynman’s quantum legacy. The next few months were a whirlwind. Somehow this video turned into a Quantum Chess battle for the future of humanity, between Stephen Hawking and Paul Rudd. And it was being narrated by Keanu Reeves! The video, called Anyone Can Quantum, and directed by Alex Winter, premiered at Caltech’s One Entangled Evening on January 26, 2016 and has since gone viral. If you haven’t watched it, now would be a good time to do so (if you are at work, be prepared to laugh quietly). So, what exactly is Quantum Chess and how does it make use of quantum physics? It is a modern take on the centuries-old game of strategy that endows each chess piece with quantum powers. You don’t need to know quantum mechanics to play the game. On the other hand, understanding the rules of chess might help . But if you already know the basics of regular chess, you can just start playing. Over time, your brain will get used to some of the strange quantum behavior of the chess pieces and the battles you wage in Quantum Chess will make regular chess look like tic-tac-toe . In this post, I will discuss the concept of quantum superposition and how it plays a part in the game. There will be more posts to follow that will discuss entanglement, interference, and quantum measurement . 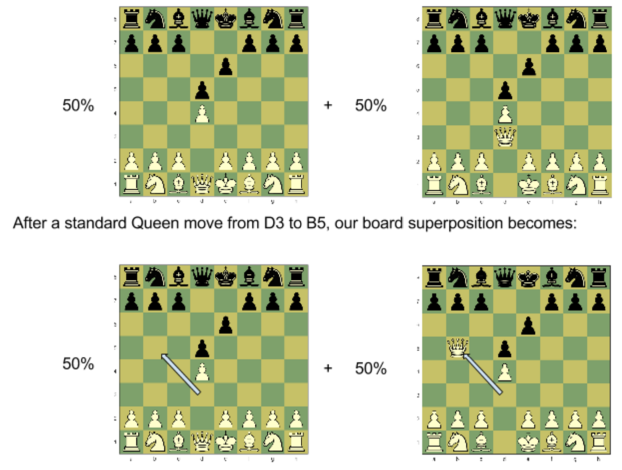 In quantum chess, players have the ability to perform quantum moves in addition to the standard chess moves. Each time a player chooses to move a piece, they can indicate whether they want to perform a standard move, or a quantum move. A quantum move creates a superposition of boards. 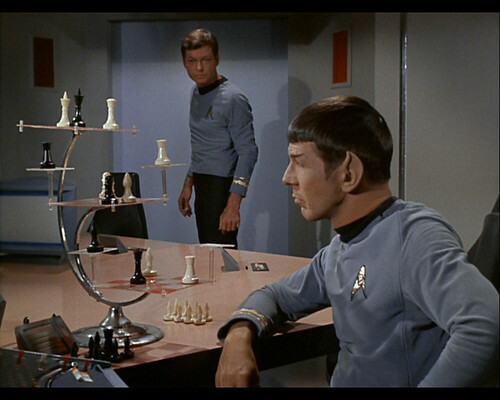 If any of you ever saw Star Trek 3D Chess, you can think of this in a similar way. There are multiple boards on which pieces exist. However, in Quantum Chess, the number of possible boards is not fixed, it can increase or decrease. All possible boards exist in a superposition. The player is presented with a single board that represents the entire superposition. 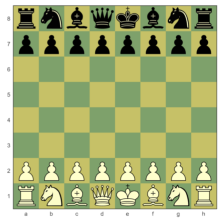 In Quantum Chess, any individual move will act on all boards at the same time. Each time a player makes a quantum move, the number of possible boards present in the superposition doubles. Let’s look at some pictures that might clarify things. 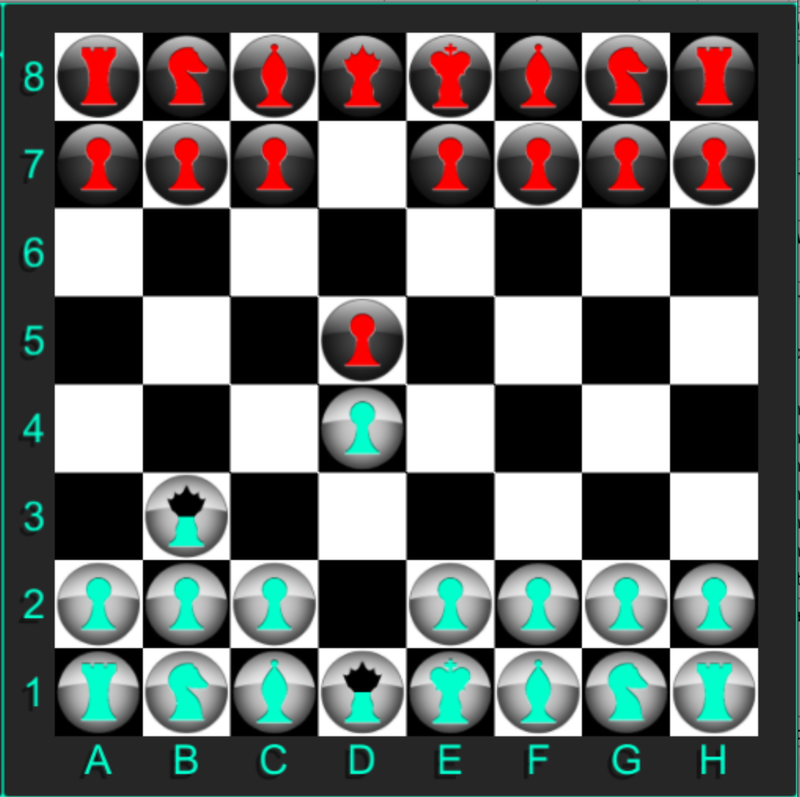 The Quantum Chess board begins in the same configuration as standard chess. All pawns move the same as they would in standard chess, but all other pieces get a choice of two movement types, standard or quantum. Standard moves act exactly as they would in standard chess. However, quantum moves, create superpositions. 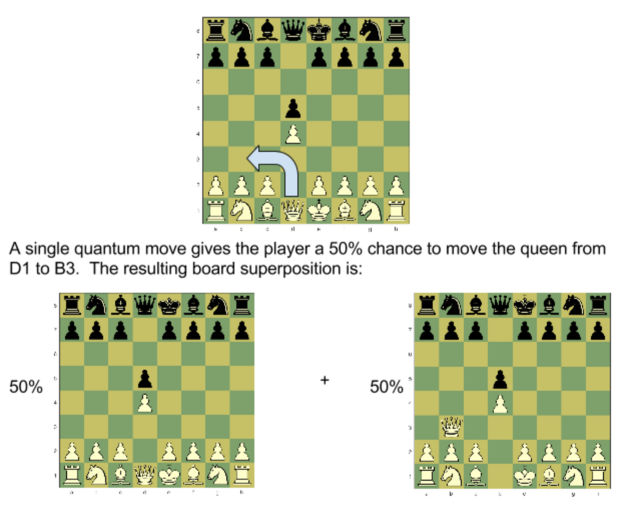 Let’s look at an example of a quantum move for the white queen. 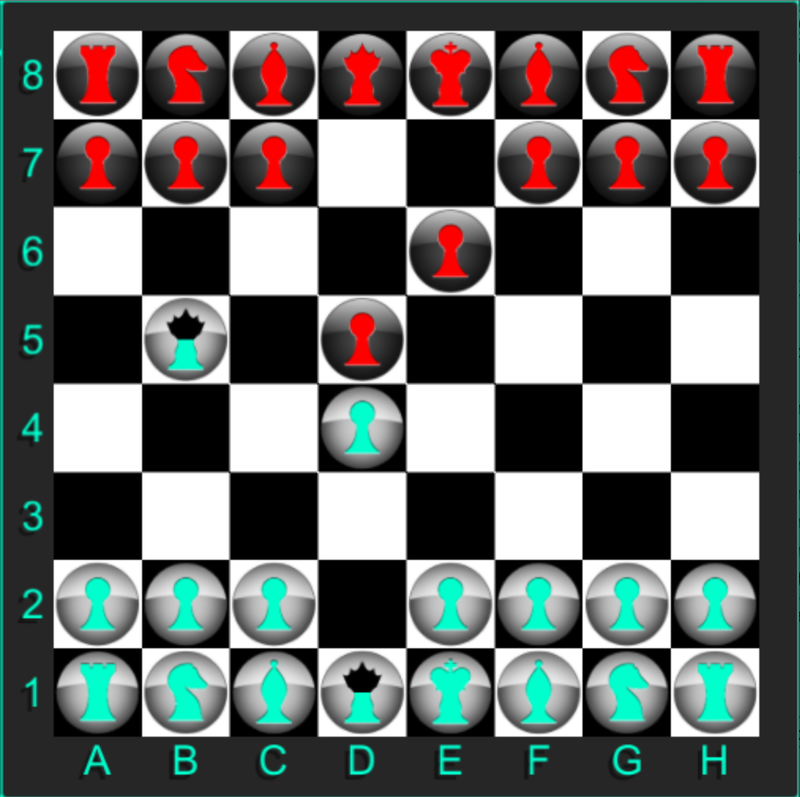 The teal colored “fill” of each queen shows the probability of finding the queen in that space; the same queen, existing in different locations on the board. The queen is in a superposition of being in two places at once. 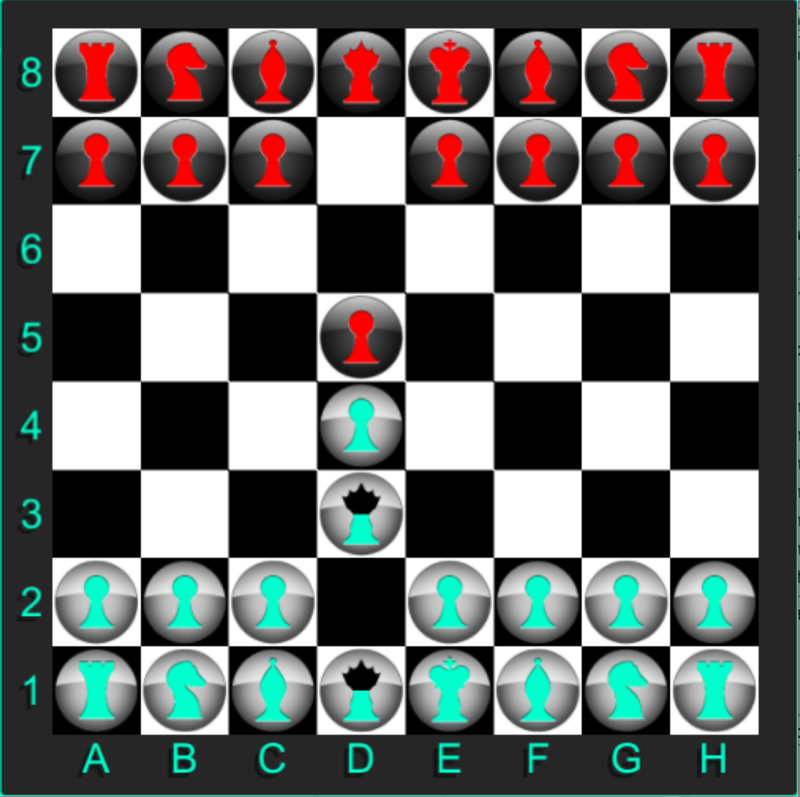 On their next turn, the player can choose to move any one of their pieces. The move acts on all boards in the superposition. On any board where the queen is in space D3, it will be moved to B5. On any board where the queen is still in space D1, it will not be moved. There is a 50% chance that the queen is still in space D1 and a 50% chance that it is now located in B5. The player view, as illustrated below, would again be a 50/50 superposition of the queen’s position. This was just an example of a standard move on a piece in a superposition, but a quantum move would work similarly. Some of you might have noticed the quantum move basically gives you a 50% chance to pass your turn. Not a very exciting thing to do for most players. That’s why I’ve given the quantum move an added bonus. With a quantum move, you can choose a target space that is up to two standard moves away! For example, the queen could choose a target that is forward two spaces and then left two spaces. Normally, this would take two turns: The first turn to move from D1 to D3 and the second turn to move from D3 to B3. A quantum move gives you a 50% chance to move from D1 to B3 in a single turn! Let’s look at a quantum queen move from D1 to B3. Just like the previous quantum move we looked at, we get a 50% probability that the move was successful and a 50% probability that nothing happened. As a player, we would see the board below. 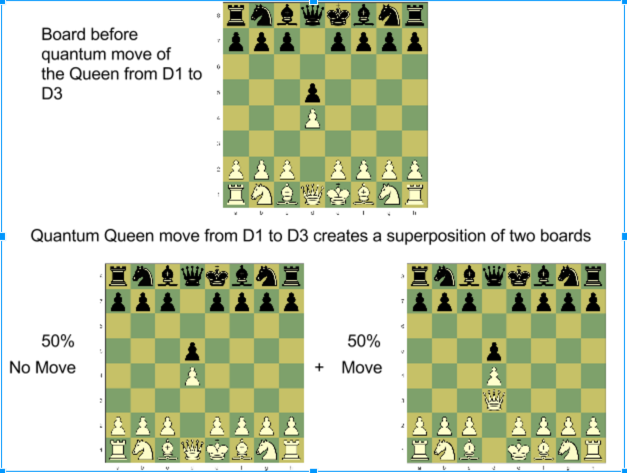 There is a 50% chance the queen completed two standard moves in one turn! Don’t worry though, things are not just random. The fact that the board is a superposition of boards and that movement is unitary (just a fancy word for how quantum things evolve) can lead to some interesting effects. I’ll end this post here. Now, I hope I’ve given you some idea of how superposition is present in Quantum Chess. In the next post I’ll go into entanglement and a bit more on the quantum move! For those who would like to know more about chess, here is a good link. If you would like to see a public release of Quantum Chess (and get a copy of the game), consider supporting the Kickstarter campaign. I am going to be describing aspects of the game in terms of probability and multiple board states. For those with a scientific or technical understanding of how quantum mechanics works, this may not appear to be very quantum. I plan to go into a more technical description of the quantum aspects of the game in a later post. Also, a reminder to the non-scientific audience. You don’t need to know quantum mechanics to play this game. In fact, you don’t even need to know what I’m going to be describing here to play! These posts are just for those with an interest in how concepts like superposition, entanglement, and interference can be related to how the game works. This entry was posted in The expert's corner and tagged chess, Paul Rudd, Quantum, Stephen Hawking, superposition by Chris Cantwell. Bookmark the permalink. Graduate Physics and Computer Science student at USC, and creator of Quantum Chess. That is possible! In fact yesterday, in the comments section of the kickstarter, we discussed a series of moves that resulted in a pawn being both alive and dead after an attack by en passant! Didn’t exactly understood the rules.The rules of superposition and entanglement and probability of a move makes it quite complex. It can get quite complex, yes. But so can chess by itself. Understanding the rules of how pieces move is only the first step. Mastering the complexity, as in almost any game, must come through practice and experience. You can also just play chess as you normally would. The level of complexity is up to you to control. As you play, and begin to understand the mechanics better, you can use more of the quantum aspects. This is pretty neat! A fine way to get people understand QM! We are aiming to start a Quantum Chess club here at IIT-Madras, India. Your explanation has helped us very much! What happens if you take a piece in a quantum state (or in superposition I’ve seen different versions with different rules for this)? Just wondering how the collapse would happen. If you took a piece in a quantum state and that piece wasn’t there (say the queen was taken in a quantum state even though the queens real position was the original), would that piece be able to hit a quantum state again? Also how would you know (or the program know) where the true piece actually lies? Sorry for all the questions, I just find this really cool and would like to try it out sometime. I just feel like I’m missing a tad bit with the rules in terms of quantum states and taking pieces. Also could you checkmate with 1 piece in a quantum state. Like say you pinned a king on one side of the board where it’s put in check by a rook but can’t move out of check without being put in check by the same rook’s quantum state (or superimposed self). I saw the video and was instantly excited about the game. I can’t wait to eventually get the game and play it.